Tired of the usual political lies and mudslinging, I decided to come up with another method to compare and contrast conservative Republicans with liberal Democrats—a method so different that no one had used it before and it could not be twisted by the usual, expected lies designed to confuse and mislead voters. When most Americans think of conservatives, they see people that are anti gay, anti abortion, supporting lower taxes for the rich and less government in addition to the right to own a weapon such as assault rifles and automatic pistols. For liberals, thanks to conservative talk-radio shows such as Limbaugh and Beck, many Americans see Democrats as evil liberals that will take away America’s cherished freedoms while supporting a woman’s right to an abortion (seen as murder by radical conservatives); will support laws that severely restrict the sale of weapons, worship the environment in place of God and for the most part believes global warming is caused by carbon emissions—something some conservatives deny with poisonous passion. In this post, you will discover that my opinion was formed from the facts that I gathered and if a bias is detected in my opinion, it came through that research. Instead of the usual hot-button political issues, I turned to obesity, most racist, most corrupt, most violent, least violent and a ranking of the smartest states. In my opinion, the results of this study from facts gathered from sources without any political agenda may surprise you and change your perception of how average conservative and liberal voters think and what they believe. When you judge someone, do not judge them from what they say but what they do: lifestyle choices. For example, an alcoholic or drug addict may deny that he is not one when his habits and behavior prove otherwise. The Huffington Post published an obesity index ranking all fifty states. Of the first twenty-five states with the least number of obese people, sixteen (64%) were liberal Blue States and seven (28%) were Red (GOP). 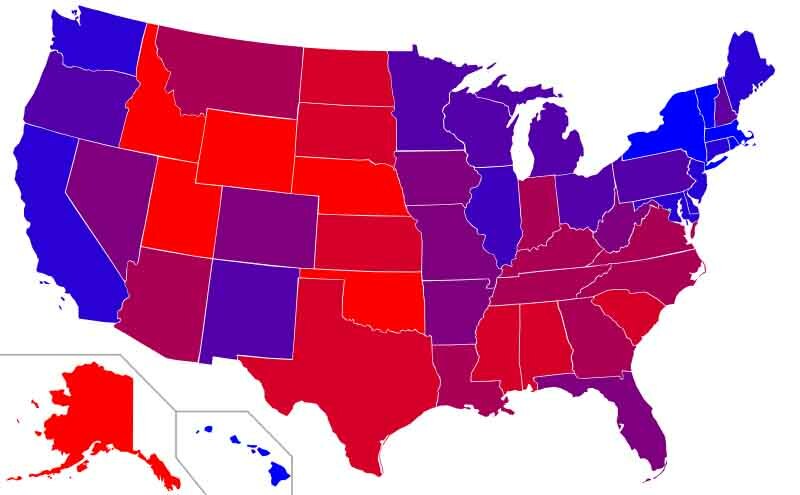 Of the twenty-five most obese states, fifteen (60%) voted conservative Red (GOP) and five (20%) went liberal Blue. Top Ten.com listed the most racist states in America. Eight (80%) of these states voted conservative (GOP) in the last five Presidential elections, and two were considered battle-ground states. None of the states on this list cast a majority vote for a Blue-state candidate (so-called liberal Democrats). Information on the eight most politically corrupt states in America came from two sources: Fox Business.com (a known conservative media corporation) and iLook China.net. Seven (87.5%) of the eight-most politically corrupt states in America voted Red and one (12.5%) went liberal Blue. The Huffington Post listed the ten most violent states in America. Number 10, Maryland, was the only Blue state (10%). Two (Nevada and Florida) are considered battleground states in the 2012 Presidential election, and seven (70%) of the top ten most violent states voted RED (conservative). I turned to Bossip.com to find the 10 least violent states in America and discovered two (20%), Utah (#5) and North Dakota (#6) voted Red. The other eight (80%) went liberal Blue. The results of the 2006 Smartest State Award (based on 21 factors from Morgan Quitno.com – click to see those factors) of the top-ten states was: eight (80%) voted liberal Blue and two (20%) went with conservative Red. It’s ironic that this quote—”You can fool some of the people all of the time”—describes the average Republican voter of today. Note: The word average, as used in this post, means applying the concept of an average to find a value about which recent data is in some way clustered. Thanks to a conversation sparked by Devin Barber, who writes Left of the Right at Gather, I’m adding this update as more evidence to help define the average Republican voter in America. It’s rather long but sometimes the shortest comment from an Internet Troll, in this case going by the name of Dan E, requires a lengthy response loaded with facts. Why does the Republican Party (GOP) run on a strict anti-abortion platform? The GOP must have a strong platform against abortion or risk losing its largest block of voters. “The most exclusionary and antidemocratic members of the Christian Right are often members of Christian political action groups such as Concerned Women for America. These are groups that regularly spread alarmist and frequently inaccurate claims about liberals, radicals, gays, and feminists. The more frequently a self-identified Evangelical/Born-Again person attends church functions, and the more conservative the theological doctrine and social beliefs they follow, the more likely they are to vote Republican. This especially stands out on the issue of abortion, with 73 percent of Evangelical Bush voters responding that abortion should be illegal in all cases, compared to only 23 percent of Evangelical Gore voters. The Republican candidate carried the state in three of the four most recent elections. – The Republican candidate carried the state in all four most recent presidential elections (1996, 2000, 2004, 2008). – The Republican candidate carried the state in three of the four most recent elections. – 6-10% of population affiliated with Evangelical Protestant Tradition. In addition 61-70% believe their religion is the one, true faith leading to eternal life (one of six states), and the Mormon Church opposes abortion. About 61% of the state’s population are members of The Church of Latter-day Saints (Mormons). Utah has the highest birth rate in the US. In a setback for the ERA, five states have since rescinded their ratifications thereby requiring ratification by eight more states. In fact, “The notion of compromise is alien to the radical religious right, because from their point of view either a belief comes from God, and is therefore absolutely and eternally true, or it comes from the secular world and ultimately from Satan, and is therefore utterly false, no matter how reasonable it may seem. “For their part, the Republicans in the United States have been happy to see their party energized by the fervor and commitment that religious right true believers can bring to the political process. Since the late 1970s the religious right has steadily transformed the Republican Party from a basically secular, conservative, civic-minded party to become the public face of legitimacy for the otherwise alien values of the radical religious right. Note: Where you find Democratic majorities in states where voters mostly vote for GOP presidential candidates and there is a high percentage of Evangelical Christians living in that state, the odds are that you will find Blue Dog Democrats representing the values of those same people. Blue Dogs are conservative Democrats that do not support abortion, gay marriages or gun control. Arizona has the only state chapter of Blue Dog Democrats. Conclusion: Fifteen of the twenty states that have not ratified the ERA are controlled by the GOP, while only one of the twenty is controlled by the Democratic Party. Four of the states may be considered swing states. If you are an American citizen and you are wondering who to vote for in the 2012 Presidential Election, Vote Smart.org offers a way to match candidates to your political views. I tested the selection process and discovered that the results depend on how you answer the questions. For example, abortion: When I selected pro-choice, the candidates were Gary Johnson, a Libertarian Republican; Barack Obama, a Democrat, and Jill Stein of the Green Party. Then I switched my vote to pro-life, and my choices were Virgil Good of the American Constitution Party, and Ron Paul/Mitt Romney of the Republican Party. The issues covered were: abortion, Afghanistan, budget, economy, education, energy, environment, guns, health care, immigration, marriage, national security and social security. Click on each issue and find out your best choices and keep score to see who you should vote for. There is a similar Vote-Easy selection offered for the Congressional Election. Vote Smart is a non-partisan, nonprofit educational organization funded exclusively through individual contributions and philanthropic foundations. Vote Smart’s founding members include former US Presidents Jimmy Carter (Democrat) and Gerald Ford (Republican), etc.